To decorate background, we used Dee Gruenig’s Inkabilities with a compressed sponge on glossy card stock. As an alternative, you can brayer your favorite dye inks on glossy card stock. 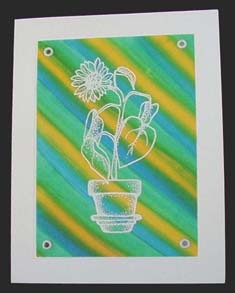 Stamp sunflower in Pot using white pigment ink and emboss with white powder. Attach card with eyelets.